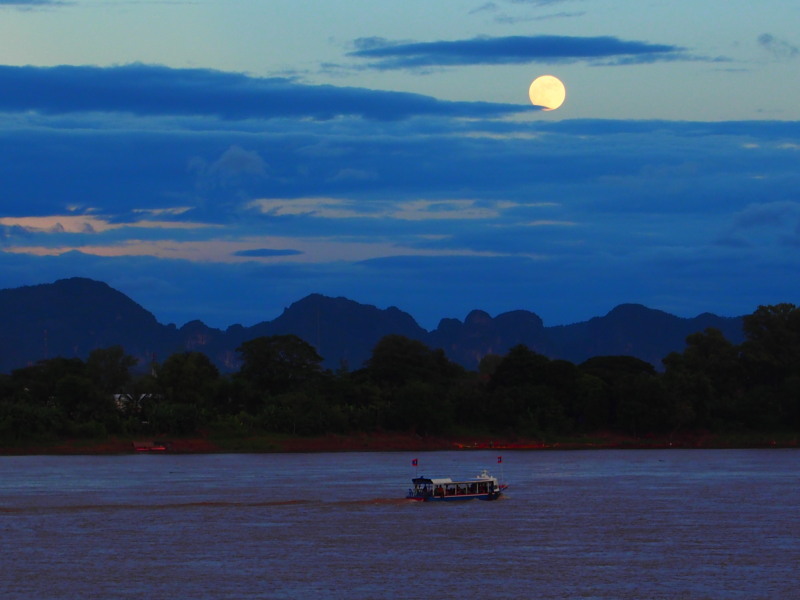 Boats, beauties and full moons. 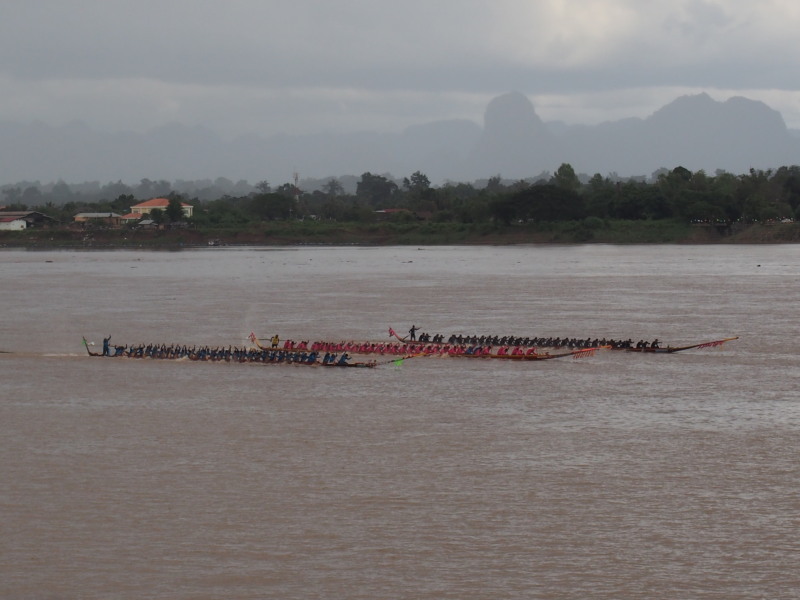 I walked down to the Mekong River early to watch the boat races the Tourist Authority of Thailand (TAT) said began at 7.30am, but there wasn’t a water vessel of any description in sight. 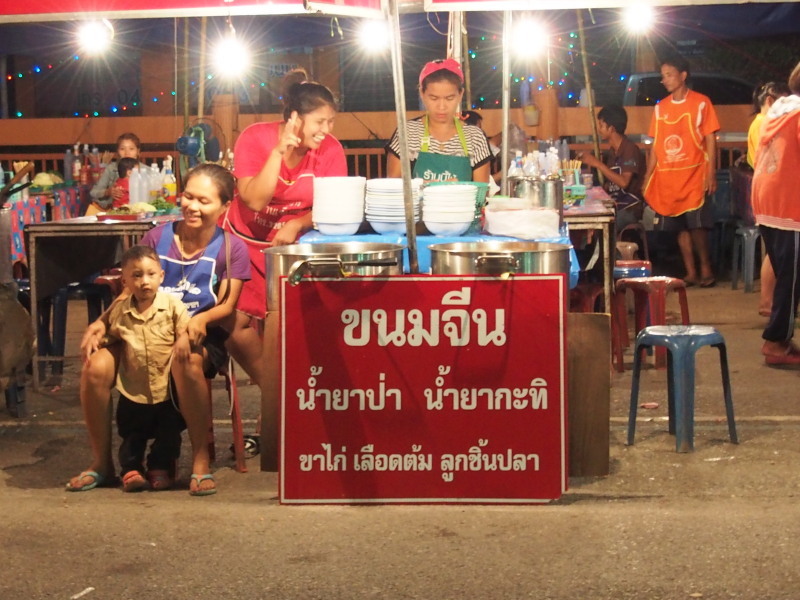 TAT can be tourist misinformation sometimes, despite their best intentions. 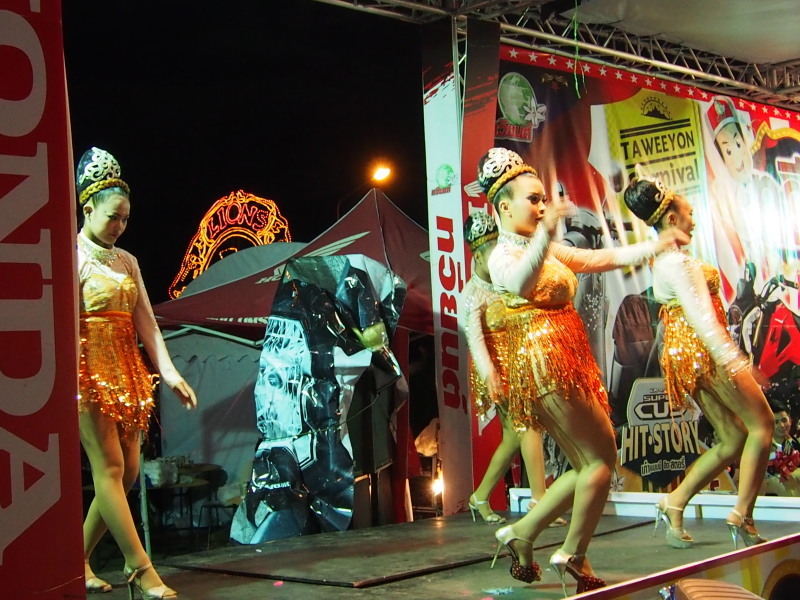 There was an alternative attraction of traditional dancing at That Phanom, a revered temple in the town of the same name, but I wasn’t confident enough in TAT’s information to take the risk of travelling the 50 kilometres to seek it out. But after coffee and a haircut and an amble around town, I returned to the river in the afternoon in time for the last two boat races. 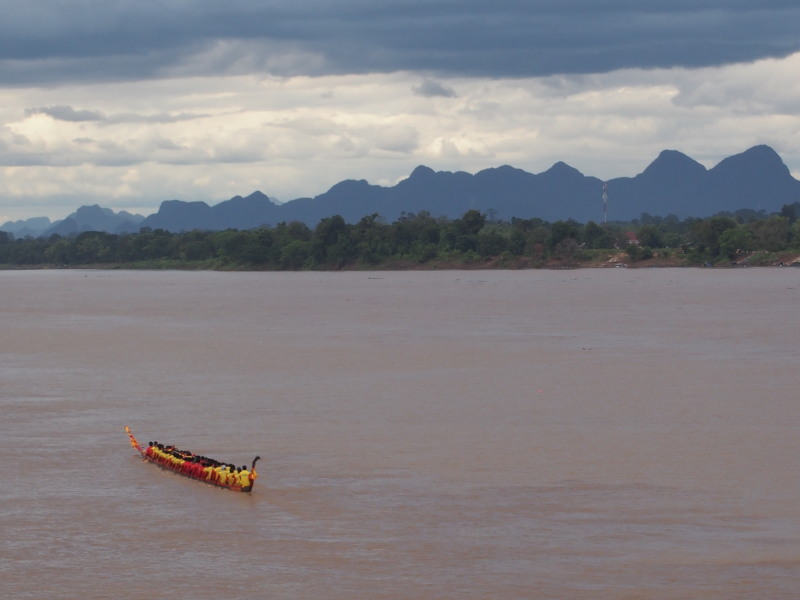 Or at least I saw the early part of them – the course is three kilometres long and the boats disappear into distant downstream. 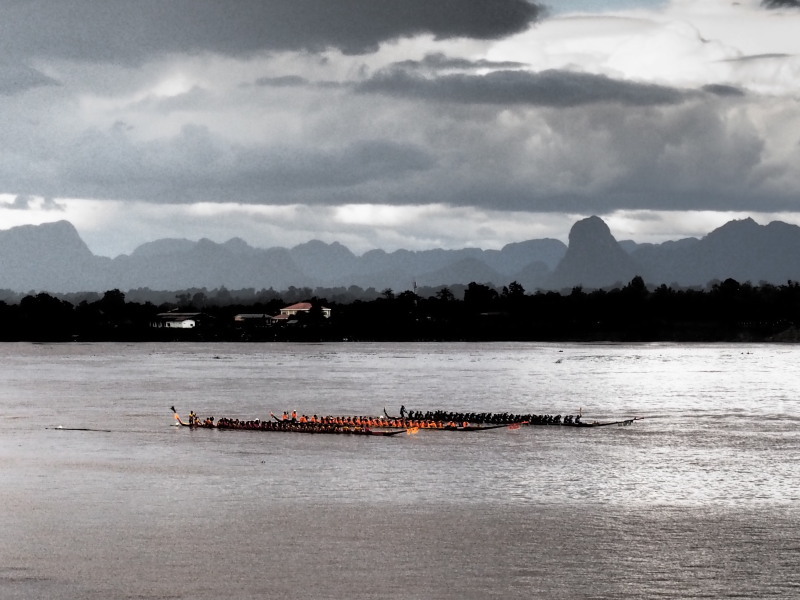 The chant of the rowers can be heard as they pass, but it’s mostly drowned out by the usual din of music and spruiking accompanying every Thai festival. That hullabaloo is part of the attraction, though. It’s also why things don’t always run to a schedule so you have to take the good with the bad (and not be too hard on TAT). 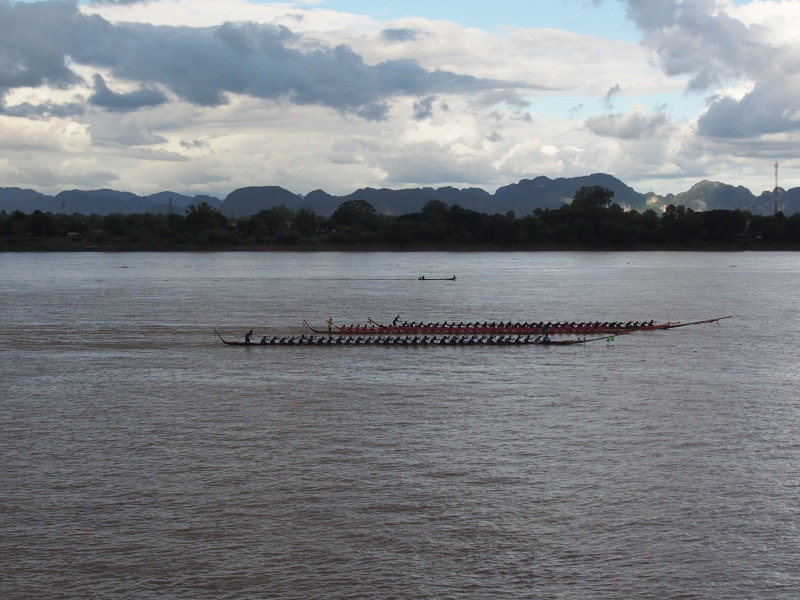 In the final, one boat drifted down from its starting position and, unable to correct, they had to row in a wide circle to restart. The current is weaker near the bank. They headed there before turning upstream. 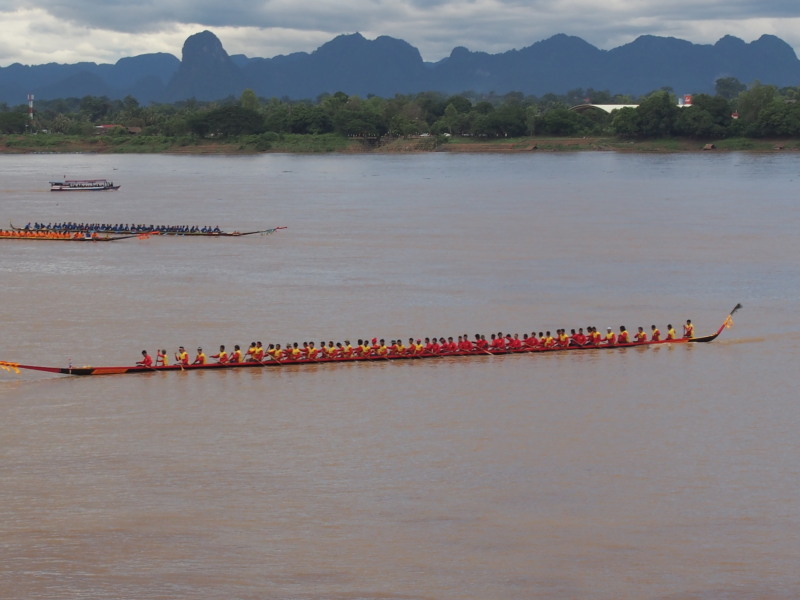 I don’t know if that extra rowing disadvantaged them. There was an excited race call in Thai, but never found out who won. I have the impression victory is somewhat immaterial, anyway, once competing finishes. The boat races are ok as a spectacle but aren’t the main focus of the festival, and are a little too distant to really engage with. 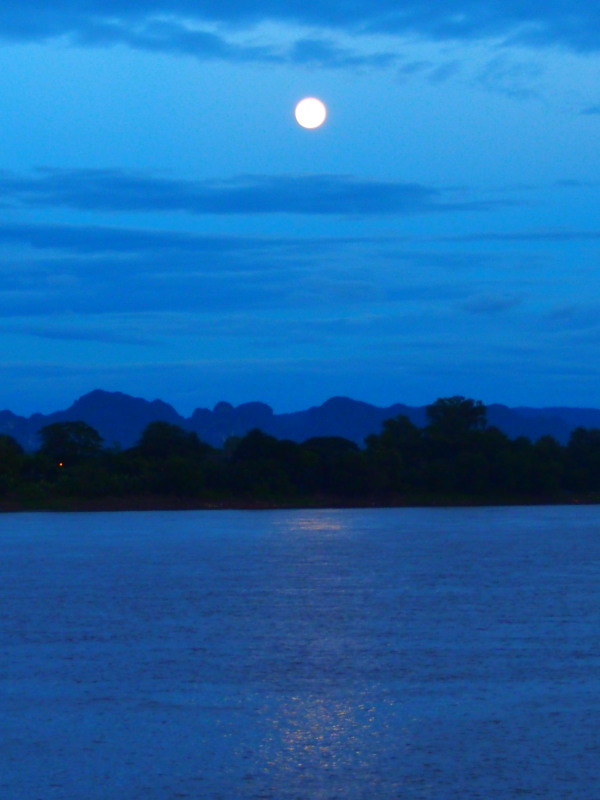 Lai Rua Fai celebrates Ork Phansa, the end of Buddhist lent and coincides with the full moon. 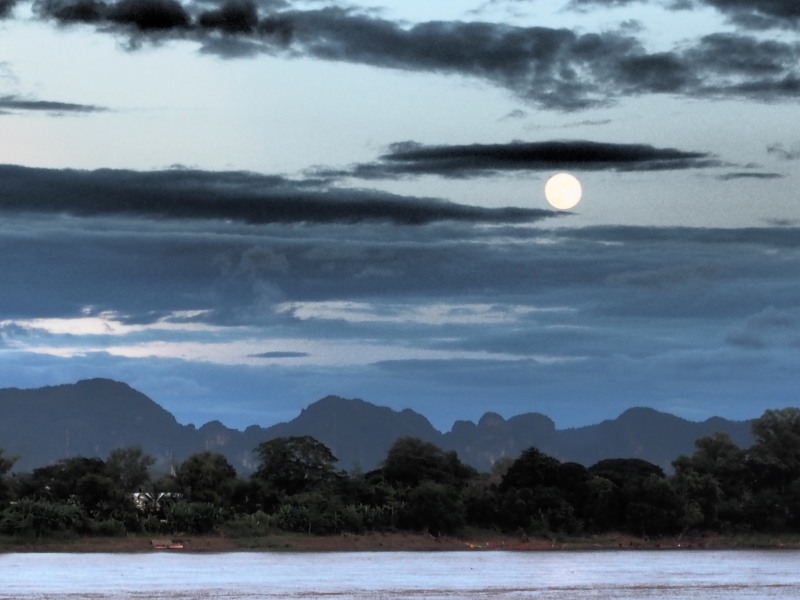 That evening it dully rose into clearing skies doing the ‘full monty’, and I went a little loony, moon mad, snap-happy. But I’m only here once in a blue moon. See the gallery for a ‘fuller’ repertoire, and a respite from puns. I ate at a makeshift restaurant by the river run by a friendly woman, but lacking an English menu. A regular customer, Chok, assisted. 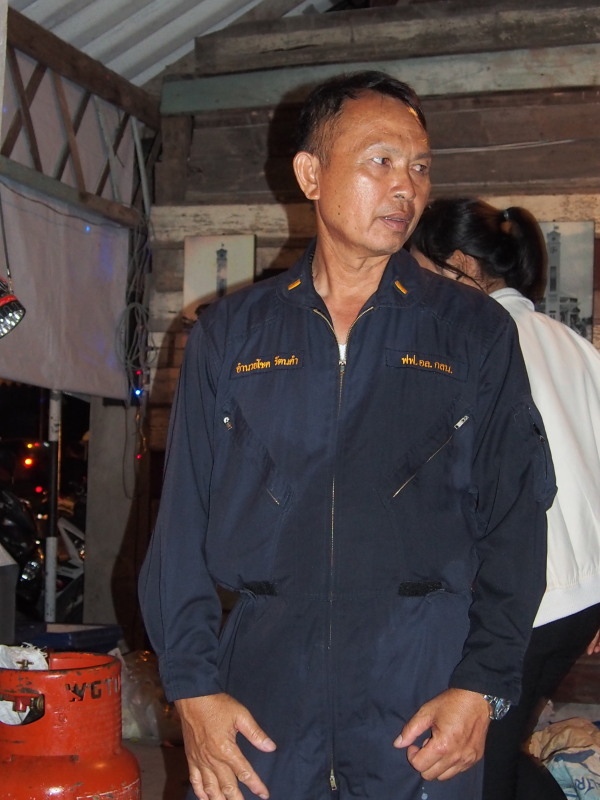 He lives in Udon Thani, but is in the Thai Navy and based in Nakhon Phanom: the Mekong being their ‘ocean’. 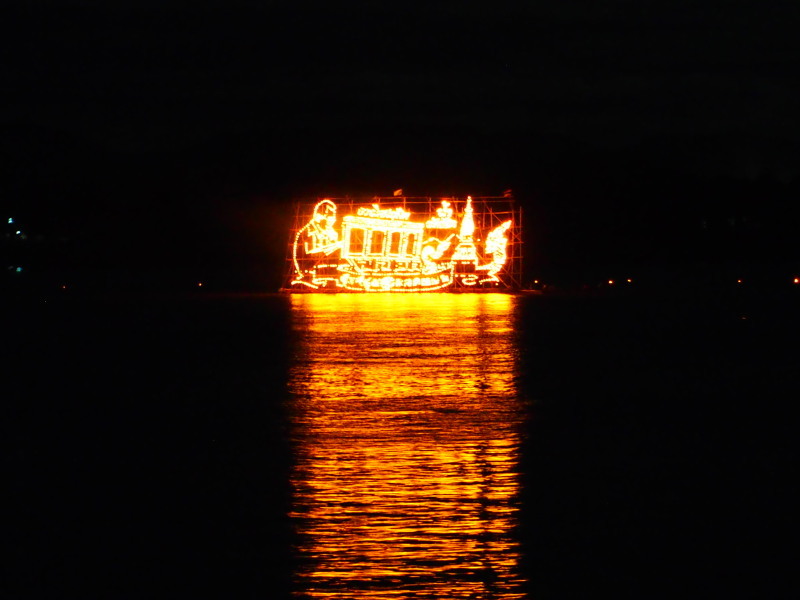 He also informed me of the 7.30 appearance of a fire boat – a prelude to tomorrow night’s procession. And there were more than moons. Everyone is gearing up for tomorrow. moon ri v er wider then the ……………..
the cycle group is moving well-still wet and windy at present. Thanks, Paul. Will look forward to hearing about your travels through the US. Nice pics Paul, beware of the effect of too much moonshine, after midnight! Cheers! Thanks, Ken. Well, there’s moonshine and ‘moonshine’. Of the alcoholic variety, Chang beer packs a big enough punch to be compared to anything concocted in Tennessee et al, but the cafes and bars here don’t seem to serve it. Make up for that by only serving other beers in large bottles – with ice, which you get used to after awhile (and notice when it’s absent). Then there’s Thai rum… Fortunately, I think I’d hit the pillow by around midnight.